Kelp is an amazing seaweed with more vitamins and minerals than any other food. It has a natural iodine content that helps support healthy thyroid gland function and normalization. 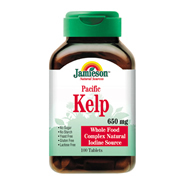 Each tablet contains: Pacific Kelp 650mg (Iodine from Kelp not less than 650mcg).